Does Stress Cause Alzheimer’s Disease? Home » General Health » Does Stress Cause Alzheimer’s Disease? Find me an American who doesn’t grapple with stress. It’s a tough charge, and it’s very unlikely you’ll be successful. We know that stress can cause poor sleep, exacerbate illness, and make you feel anxious or depressed—but will chronic stress put you on the fast track to Alzheimer’s? New research is suggesting that it might. Stress has been identified as a potential cause of Alzheimer’s for years. Studies have noted that Alzheimer’s patients tend to have higher levels of cortisol (the stress hormone) in their blood, and a new study is showing that stress increases the production of specific proteins that are a telltale sign of dementia and Alzheimer’s disease. With over 75 million Americans reporting to have some form of stress in their lives (including chronic stress) and Alzheimer’s rates expected to skyrocket in the coming years, stress’ impact on Alzheimer’s could be a major health concern—and breakthrough—if these results prove correct. It’s entirely feasible to see how chronic stress could cause Alzheimer’s. Let’s take a look at why. Alzheimer’s disease is the most common form of dementia and it currently impacts over five million Americans, with that number expected to jump by 40% by 2025. It generally impacts people 65 and over, and more women than men get it; however, this could be in part because women live longer than men. And the older you get, the higher your risk is of developing it. In a nutshell, Alzheimer’s is basically your brain going into atrophy. You may have heard of muscle atrophy before; it typically happens when you don’t use your muscles and they begin to wear away. Well, the same thing can happen to your brain cells—but the reasons as to why are less clearly defined. The amount of brain cells diminishes and so do their ability to communicate. When this happens, it becomes much more difficult to recall past memories, form new ones, and perform a number of tasks as fluently as you used to. The atrophy is largely related to the formation of plaque caused by proteins called beta-amyloids, which we will discuss momentarily. Because Alzheimer’s is a concern for virtually anyone over the age of 65, it’s something you should be on the lookout for. There are 10 warning signs of Alzheimer’s that can help you decide if you or a loved one should seek a professional opinion. I’d like to point out that everyone reading can probably check off a handful of these symptoms; they are totally normal. However, if they are occurring frequently and beginning to have a greater impact on your daily life, they could signify a more serious condition. 1. Memory loss, including things like regularly forgetting important dates or events, taking medication, etc. It can also mean asking for the same information repeatedly and the need for increasingly relying on memory aids for simple tasks. Does Stress Really Cause Alzheimer’s? A new study conducted by researchers at the University of Florida suggests that there is a possible connection between stress and Alzheimer’s. This echoes the results of an older study, but by identifying another contributing factor of stress on the development of beta-amyloid proteins. Beta-amyloid proteins are isolated molecules that have little effect on brain health when they are alone and isolated. However, when they are produced in increased numbers, multiply, and connect, they form a plaque that ultimately limits connectivity and connection in the brain that leads to Alzheimer’s. The study noted that stress stimulates the production of the corticotropin-releasing hormone (CRF hormone), which seems to play a major role in increasing beta-amyloid protein production. In turn, this can speed up the time it takes to form the irreversible plaque that is responsible for the notorious effects of Alzheimer’s disease. Although more work needs to be done to truly identify stress as a contributor to Alzheimer’s, this development is definitely something to pay close attention to. Although there is no identified definite cause of Alzheimer’s, there is consensus that it’s likely a multifaceted combination of factors. The factors include lifestyle and environmental factors that affect the brain over time, in addition to genetic factors. Genetic factors, however, are only estimated to contribute to about five percent of cases. Lavender can offer relief from stress and anxiety in addition to creating an enjoyable scent. There is research that confirms when inhaled, lavender can have soothing and calming effects. You can massage lavender oil into your skin, soak in a bath, or burn oil to set a calming atmosphere in your home. One of the best ways to de-stress is by adopting a meditation or mindfulness regime. But it’s also one of the most difficult to learn; after all, shutting your mind down is almost impossible. I’d suggest sitting in a chair that keeps you straight up, or even on the floor—as long as your back is in an upright position (and the room is quiet). Close your eyes and begin to take deep, even breaths. Focus carefully on each breath as the air goes in and out of your lungs. Once you’ve established a rhythm, take your mind off the breathing and just exist in the time and space around you for about 20 minutes. Bennet, D., “UF Health researchers find some evidence of link between stress, Alzheimer’s disease,” University of Florida web site, September 16, 2015; http://news.ufl.edu/articles/2015/09/uf-health-researchers-find-some-evidence-of-link-between-stress-alzheimers-disease.php. “Stress Facts,” GoStress.com; http://www.gostress.com/stress-facts/, last accessed September 30, 2015. 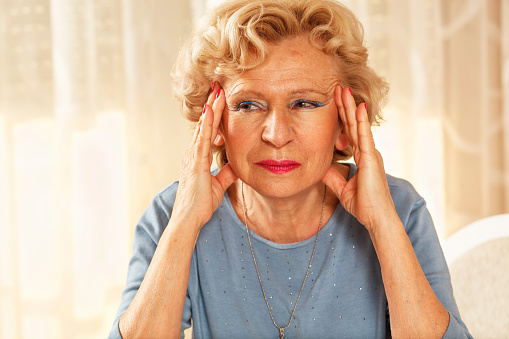 “Stress and its influence on Alzheimer’s disease,” UCI Institute for Memory Impairments and Neurological Disorders web site; http://www.alz.uci.edu/stress-and-its-influence-on-alzheimer%E2%80%99s-disease/, last accessed September 30, 2015. “2015 Alzheimer’s Disease Facts and Figures,” Alzheimer’s Association web site; http://www.alz.org/facts/, last accessed September 30, 2015. Ehrlich, S., “Lavender,” University of Maryland Medical Center web site; https://umm.edu/health/medical/altmed/herb/lavender, last accessed September 30, 2015.